Evening Shadows | OK Listen! EVENING SHADOWS is a sensitive, heartwarming Hindi feature film about a woman who is caught between her duty towards her husband, and the great affection she has for her son. Her world comes crumbling down when her son comes out to her. The film has won 13 international awards and screened at more than 50 international film festival across the world. The film is releasing on January 11, 2019 in theaters. 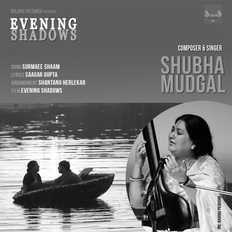 The film 'Evening Shadows' has a beautiful soul-stirring song 'Surmaee Shaam' composed and sung by eminent musician SHUBHA MUDGAL. Lyrics are by SAAGAR GUPTA and musical arrangement is by SHANTANU NANDAN HERLEKAR. The song is a beautiful rendition of the emotional state of a woman who is caught between her husband and son, like a river that flows silently between two banks.